Most people never question the ingredients that are in the products they use on a daily basis, and that's especially true of toothpastes. One of the most commercialized products –toothpaste- is generally believed to be both effective and safe. Is this actually true? You be the judge! It might come as a shock to you that the very same product that is supposed to help you to maintain your oral health can slowly eat the enamel of your teeth, causing the erosion of your tooth enamel. This is particularly true for specialty toothpastes that promise to remove tarter, whiten your teeth or lessen your sensitivity. 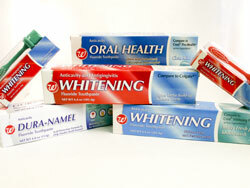 Most of these toothpastes contain a high radioactive dentin abrasion (RDA). The RDA is the value that is used by the FDA to measure the abrasiveness of toothpaste. The values can range from 30 to approximately 250. The abrasiveness of toothpastes depends on the amount, size and the hardness of abrasive additives included in the toothpaste. While tests on the RDA levels may vary from lab to lab, the toothpastes must go through a complex process of testing to determine if their abrasiveness. It is recommended that the safest abrasive level should be bet ween 0-150 RDA. Because many health professionals and concerned manufacturers have an interest in finding a safer alternative, we have developed Rejuva™ Smile, probiotic toothpaste that promotes a healthy dental and oral environment by combating harmful strains of oral bacteria that causes tooth decay and cavities. Rejuva ™ Smile is a new cavity fighting technology that offers a more effective, non-abrasive, safe, natural alternative to conventional commercial toothpaste. Most importantly, it has a zero RDA value meaning that there are no abrasives added in the toothpaste. Oral hygiene is important for your health. You know the drill: Have checkups twice a year (an ounce of prevention is always worth a pound of cure); eat a diet rich in fruits, vegetables, grains and nuts and low in saturated animal fat. And learn to love life without sugar. This is a great way to stay healthy in body and mouth. However, while you are encouraged to be meticulous about taking care of your mouth, it's just as important to pay close attention to the products you use to do it.